Greetings from the Hive Jump Team! Now that we’ve successfully Kickstarted Hive Jump, fans and fellow Kickstarters alike want to know how we overcame the failure of our first campaign to clutch success with our reboot. Below are a few questions we seem to get asked most often. So, we thought we would fire up the ol’ blog-o-matic and get these questions answered in a shareable fashion! Enjoy! 1) What valuable lessons did you learn from your first attempt at Kickstarter? The number 1 lesson learned was: Don’t use your campaign to announce your game. Kickstarter is quickly becoming saturated with tons of content. Even if you have a high quality concept, it can be difficult to stand out from all the other campaigns and reach your goal within 30 short days. By building awareness of your game BEFORE you launch your campaign it will help you achieve the momentum needed to stand out among the other concepts quickly. Remember, Kickstarter is somewhat psychological – if you capture a large portion (10%+) of your goal on day one, it can give the perception that you are a “winning horse” worth betting on. Conversely, if you are going into your second week and haven’t reached 10% funding, visitors ask themselves “What is wrong with this project?” and tend to stay away. A close number 2: You must be active with your campaign the entire time. We’ve really not found an exception to the rule. Our first time around we planned updates, and posted work online, and even tried to secure an article or two… it was an unsuccessful campaign. The second time around we were constantly online: sharing on the Hive Jump facebook page, sharing on @hivejump via twitter (every hour on the hour, nearly 16 hours/day) sharing on Kickstarter, commenting on other projects, answering comments and questions, doing AMAs on reddit, reaching out to press and other promoters. It was non-stop… but it was a successful campaign. Want to learn more tips on rebooting your Kickstarter campaign? 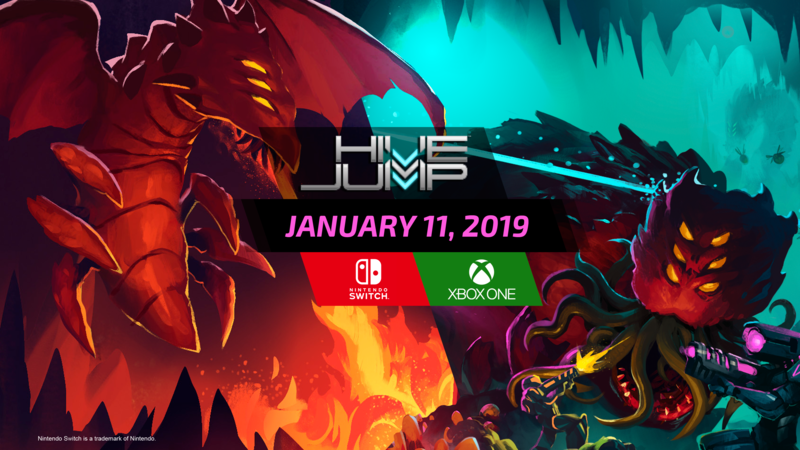 Check out 10 Lessons Learned from the Hive Jump Kickstarter from Matt Donatelli of Graphite Lab who presented on this very topic at the St. Louis IGDA mini-mortems event in November. 2) Did the failed initial launch humble you and your team? And how so? 1. Better visibility! Aside from a slow funding start, the biggest criticism day 1 was that the game “came out of nowhere” and not in a good way. There was literally NO press about the game when we launched because we used the Kickstarter campaign to announce the thing – rookie mistake. We’re meeting with press at GDC in a few weeks to ensure this isn’t an issue when we reboot! 2. We’re refocusing our funding goal. Lower isn’t always better, but a lower goal certainly puts the project in a more positive light in terms of percentages. We’ve secured some additional private funding to keep the project rolling during the refactoring process so we can reboot with a lower funding goal. 3. We’re improving the visual style. We’re still in love with pixel art – but we’re working around the clock to up-res the visuals to be more detailed and more suitable to show off the AWESOME capabilities of SPRITE LAMP – making Hive Jump one of the first games to use the dynamic lighting technology. 4. We’re completing more of the game. We realize that we need to develop much more of the game in order to show more UNIQUE features on DAY 1. We’ll reboot with a more complete WEAPONS system, AI and BUGS system, CAMPAIGN explanation and much more! 5. We want the game to be played worldwide, this means Localization! English, French, Italian, German, Spanish and Russian are our targets. We’ve localized many of our previous titles and underestimated how important this would be to making this game truly global. 6. We’re crafting a plan for consoles. We know this game would be great with local “couch” multiplayer, so we’ve brought that forward. This will make prepping the game for CONSOLES like WiiU, PS4, and XBOXONE much simpler. We will be meeting with reps from Nintendo, Microsoft, and SONY at the Game Developers Conference in March to discuss opportunities. We will reboot with a plan for consoles DAY 1. 3) Did you network and ask others in your industry for some insight? Most definitely. Aside from keeping in close touch with other developers from our area (St. Louis, MO) we also took a demo to GDC to share with our friends in publishing as well. We continued to study articles written by ace KS pros like Jamey Stegmaier and tweak our plan to return to Kickstarter. We wound up delaying our reboot 3 times in order to apply more improvements to our campaign, all while continuing to build our following. Start a facebook page for your campaign and invite your friends to like the page and comment on the game idea. Store up a few bucks and invest in facebook ads that build likes for the page as well as followers. Start a twitter account for your campaign and invite your friends to follow the account and share it with their friends. Then sign up for Tweetdeck and schedule tweets about your upcoming campaign to occur at common intervals (few times a day or more). Post a preview link to your (completed, but not launched) Kickstarter page to your friends. Invite them to comment on all aspects of the page (design, backer rewards, etc.). 4) Did you find keeping a consistent stream of communication with initial backers as an important step in relaunching? We think it was incredibly helpful. While not every backer returned to support us, we did see a significant number return to support Hive Jump. We posted 13 updates between February ’14 (when we cancelled campaign #1) and August ’14 (when we relaunched). We continued to take interviews, join podcasts, and write articles during this hiatus as well. Many of those initial backers returned at or above the backer level that they originally committed to. 5) Did you feel that there was a certain grace period you had to relaunch in order to keep fans and initial backers involved? We had 221 backers in our first campaign. We were told by a handful of people that we could get as many as 80% of these back if we relaunched within 1 month, and 50% if we launched within 3 months. So we initially set a date to return to Kickstarter within 60 days. When that deadline approached we realized that we just weren’t ready and decided that we would simply return when the project was ready. That turned out to be 6 months later, but allowed us to achieve each of our 6 goals above.